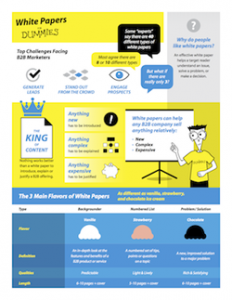 We recently came across a cool infographic on case studies from B2B copywriter Sandra Jean-Louis. It sums up so many great tips that we asked Sandra if she’d be willing to share it here. That’s because they use storytelling to relate the customer’s experience; they highlight a marketer’s unique differentiators in a compact form; and they’re a small investment that can pay dividends for years. Yet, there aren’t many resources for developing these power-packed documents. After taking Casey Hibbard’s course (a must if you’re serious about learning to write case studies), I looked around for a cheat sheet or checklist I could post to my wall for reference. My search only turned up more courses and blog posts. That’s when I decided to create a visual summary of the key steps to creating a case study. 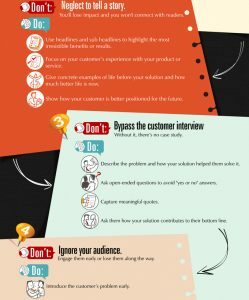 I’ve received a lot of positive feedback from other writers and marketers who say this infographic is easy to follow and packs a punch. Here it is. Feel free to use it to stay on track and avoid common mistakes. Click on the graphic to download the full-size PDF. And if you have any further tips that help you create great case studies, please leave us a comment below. 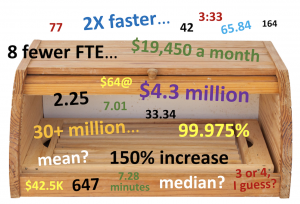 How many case studies are "enough"?